Home Tags Posts tagged with "venison"
Right. It’s the middle of the summer, 30 degrees outside (we’re using the metric system here, remember? 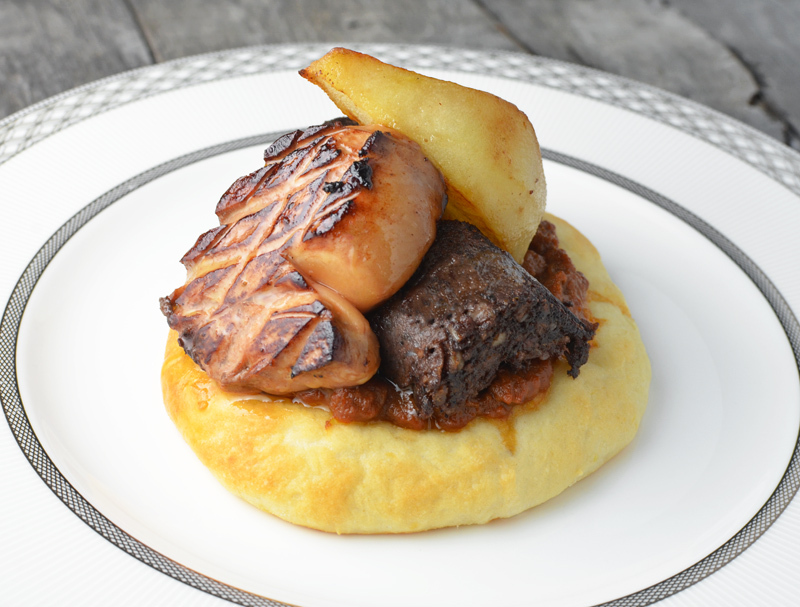 ), and here I am with my recipe for goulash, blood sausage, and foie gras, like it’s Christmas all over again. As you can imagine, I actually started working on this several months ago, but now you’ll just have to bookmark this page until winter. The dish is inspired by the decadent cuisine of Au Pied de Cochon in Montreal, where I try to go on pilgrimage once a year. Portions are gargantuan: the charcuterie plate, in the apéritif section, is larger than the typical board for two that New York eateries sell for double the price. 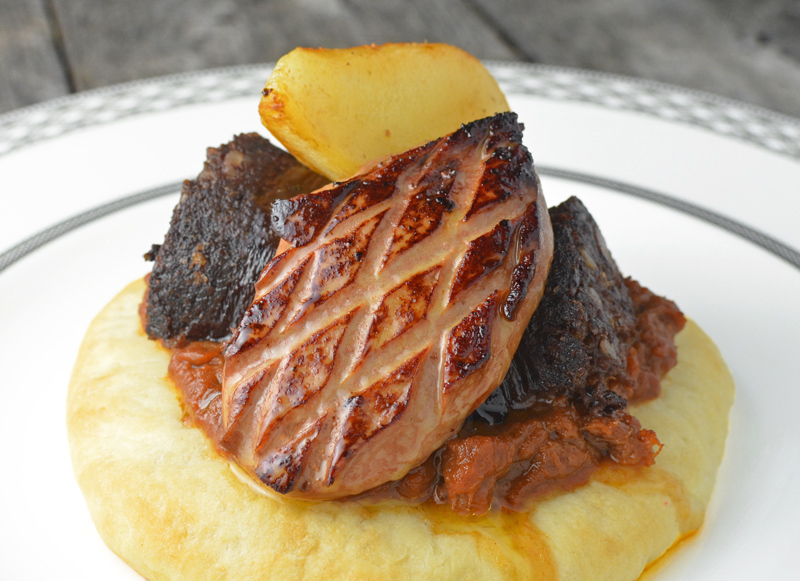 Expect to eat at least half a lobe of foie gras per person regardless of what you order. Emptying your plate tends to draw the waiters’ respect. And for a good reason — I dare you to finish the stuffed pig’s foot (stuffed with foie gras, naturally), especially after the charcuterie plate. While they have desserts (of similar proportions, with maple syrup replacing foie gras), you’re highly unlikely to make it that far. There’s no particular merit in serving huge portions, of course — half of America does it. But the food actually tastes very good, and we’re talking about ingredients that are so rich and/or expensive (I once had an entrée with something like an ounce of black truffle), most people consume them in much smaller doses. That’s what makes the place decadent! And for those who want to try Chef Martin Picard’s cooking at home, there’s a cookbook. So after trying the tarte de boudin et foie gras au sel (a blood sausage and foie gras tart), it occurred to me that I could very easily spin a Hungarian-inspired variation. Why leave all the decadent dishes to the Canadians? Eastern Europe has tons of rich food to compete! Last I checked, blood sausage and foie gras weren’t invented in Quebec, were they? 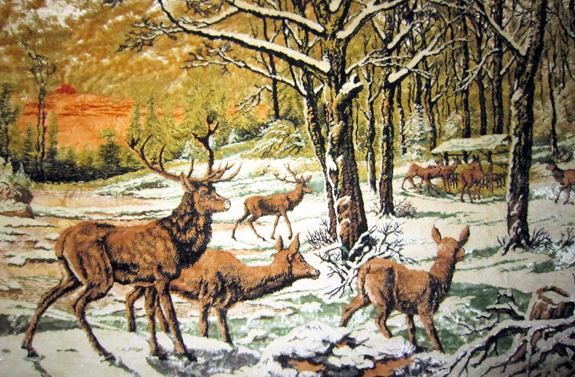 And while we’re at it, why not up the ante a bit, and add some hearty venison goulash? 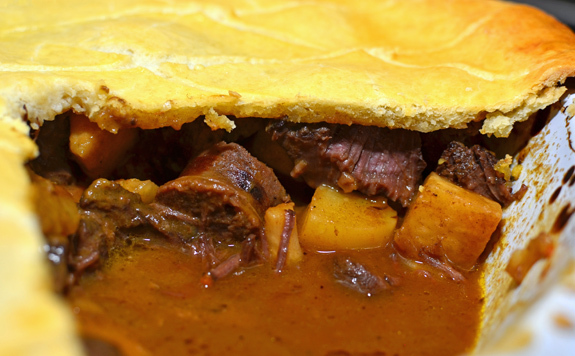 I’ve written the recipe to make 12 servings, mostly because it would be hard to accurately scale down the venison goulash and the lángos dough. 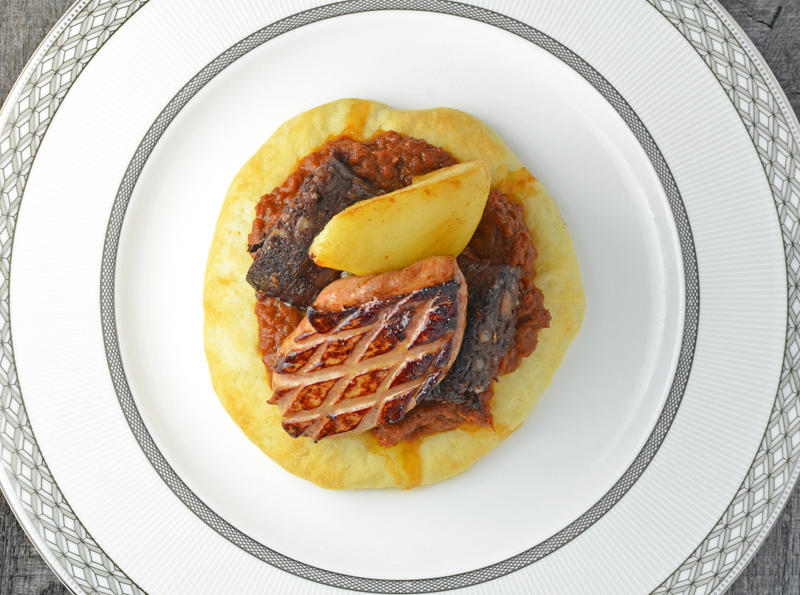 Still, you could choose to make 12 goulash tartlets, top only a fraction of them with blood sausage, foie gras, and pear, and use your imagination to come up with something else for the remaining ones. In the pot of a pressure cooker, sauté the meat in half of the canola oil over high heat. Season with salt, and cook until brown on all sides, stirring frequently. Reserve. In the same pot, sauté the carrot, celery root, red pepper, onion, and garlic over medium heat until lightly colored. Stir in the tomato paste and paprika, and cook until brown. Return the meat to the pot, then add the red wine, and simmer for a couple minutes. Add the water, seal with the pressure cooker lid, bring to pressure, and cook for 1 hour. Let cool for 30 minutes. Pass the goulash through a colander to strain the stock. Reserve the meat and vegetables. In a saucepan over high heat, reduce the stock to about 120 g, and remove from the heat. Transfer the reduced stock to a blender, and add the butter and paprika. Coarsely chop the stew meat and vegetables, then add to the blender as well. Process until almost smooth, and salt to taste. Let cool and reserve. Place the potato in a pot of water, and cook over medium heat until very soft. Mash the potato, and measure 150 g.
Sift the flour into the bowl of an electric mixer fit with the paddle attachment, then mix in the salt. Add the yeast mixture and the rest of the milk, mixing on low speed. Add the butter and the mashed potatoes, mix for another minute, then cover with plastic wrap, and let rest for about 1 hour. Divide the dough into 12 parts. Using your hands, flatten each lángos into an 11-12 cm diameter disc. Transfer to baking sheets lined with parchment paper, cover with plastic wrap, and let rest for 30 minutes. Place a dish filled with water on the lower rack of your oven, and preheat to 225 C / 450 F.
Bake the lángos on the middle rack for 5 minutes. Take out of the oven, cover each lángos with some of the goulash spread, then return to the oven, and cook for another 4-5 minutes, until the lángos are slightly golden. Remove from the oven, transfer to a cooling rack, and reserve. Peel and core the pears, then cut them into 6 wedges each. In a pan over low heat, sauté the pears in the butter. Sprinkle with the superfine sugar, and cook until golden brown on all sides. Cut the foie gras into 12 pieces, each about 2 cm thick. Season with salt and pepper on both sides, then draw crosshatches on one side using a pairing knife. Sauté the foie gras crosshatch-side down, in a hot pan over high heat. Remove some of the rendered fat from the pan regularly, reserving it for the next step or for other recipes. Flip the foie gras, and cook until just brown on both sides. Reserve. Peel the blood sausage, and cut into 12 pieces, each about 2.5 cm thick. In the same pan as the foie gras, sauté the blood sausage in some of the rendered fat. Cook over medium heat until brown on all sides. Reserve. 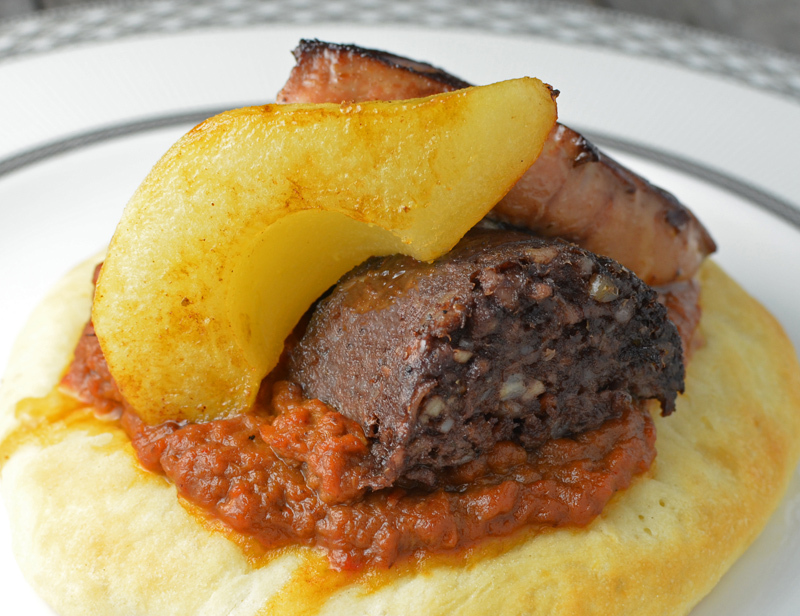 On each each tartlet, arrange one piece of blood sausage cut lengthwise, one piece of foie gras, and one piece of pear. Finish the tartlets in a 225 C / 450 F oven for about 2 minutes, and serve immediately. No garnish necessary—you’ll eat vegetables another day. As we’ve eaten our way through the deer I killed last fall, I’ve started cooking some of the backstraps, those beautiful 20+-inch-long pieces of loin. I’m thrilled to say that this is without a doubt the best venison steak I’ve ever eaten, and it has totally justified spending three days in a tree strand. 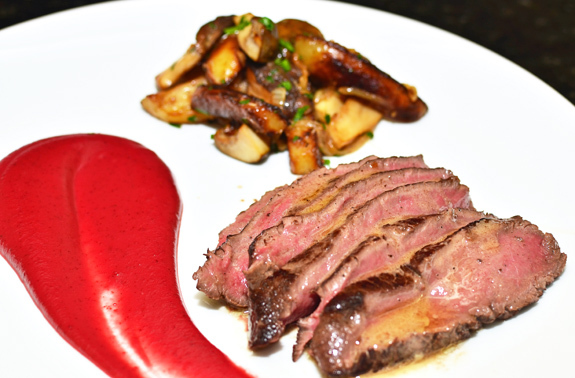 The meat is both pleasantly gamy and butter-tender, thus surpassing beef filet mignon. And unlike restaurant servings that often consist of one tiny little medallion, for once quality comes with quantity! Summer may just have started, but read this post again in a month when the temperature hits 100 F and your AC breaks down. Imagine yourself in your mythical Russian dacha in the fall. After a fructuous hunt some previous day, you decide to hit the woods again to look for mushrooms after last night’s storm, and fill a basket within a few hours. You happen to walk by a cranberry bush on your way home, and fill another basket, patting yourself on the back for never leaving the house without two empty baskets. Before going into the kitchen, you stop in your garden, where, of course, you always grow beautiful red beets. And you still have potatoes from the last harvest. Skipping the part where you milk the cow, you collect the cream and make butter, you contemplate nature’s bounty as you pause between two chapters of The Omnivore’s Dilemma, and you notice, almost in passing, that you now have all the ingredients for a dish that combines the five tastes: steak that will be properly seasoned with salt, a beet-cranberry purée that’s acidic, bitter, and sweet at the same time, and umami-packed mushrooms. Some readers may remember the tourtière du lac from M. Wells Steakhouse, a debauchery of game meat encased in pie crust that fits quite well with my somewhat idealized conception of Eastern European cuisine — the one wherein everyone hunts for their own food, and then spends their days making excessive yet elaborate recipes overflowing with meat, root vegetables, rich sauces, and pie crust. As much as I loved the idea, I was a little disappointed that the various meats in M. Wells’ version were hard to distinguish from one another and suggested offering fewer meats, with variations on texture instead. Putting my money where my mouth is, I started working on my own venison-centric version. 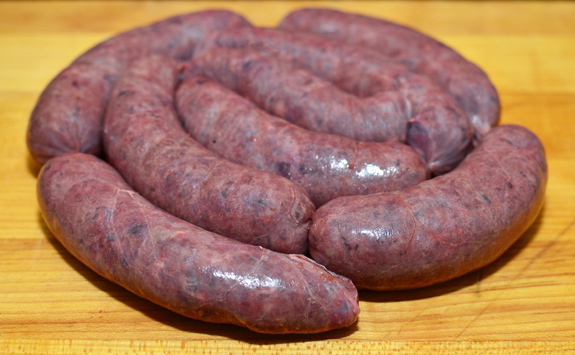 I’ve already posted recipes for goose sausages, lake trout sausages, salmon sausages (with beef fat). With two deer in the freezer, venison sausages were the natural thing to do next, and I might very well come up with more than one version. Today’s venison sausages are made with beets. Beets contain a flavor compound called geosmin that’s responsible for their earthy taste. In fact, the word geosmin comes from “earthy smell” in Greek. This is the same compound that you find in red wine with earthy notes, and fish with a muddy taste (more on this here). I couldn’t find a list of the flavor compounds in venison, but in my sausages, the smell from the beets serves as a subtle reminder of the deer’s natural habitat. 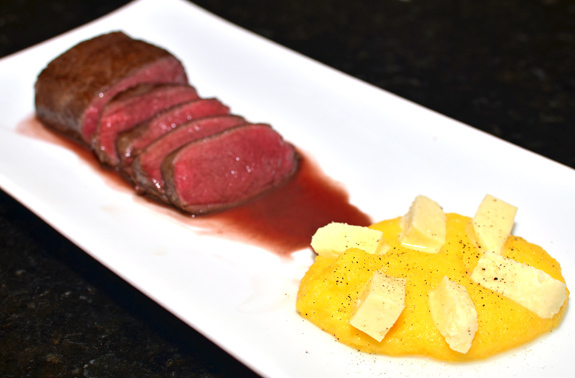 While you can’t really pinpoint the beet flavor in the final product, you do taste something that complements the flavorful venison meat. A whole deer, even if you keep the backstraps and legs whole, yields a lot of ground meat, mostly from the neck and the belly. This is nothing to worry about: these are the perfect cuts to make burgers. 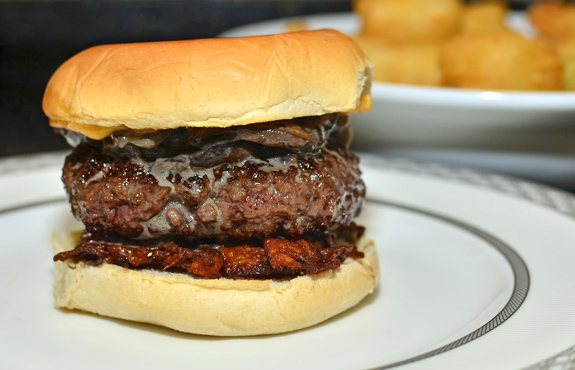 All you need is a good repertoire of burger recipes. And of course, if you don’t like venison, ground beef from your favorite butcher or CSA (what, you don’t have a CSA???) will do. I’ve already blogged about Bohemian Venison Burgers and Hungarian Lángos Goulash Burgers. This time, I’m doing a Polish / Belarusian / Ukrainian version. Hey, with enough deer meat, I might post one burger recipe for each country of the Eastern Bloc!